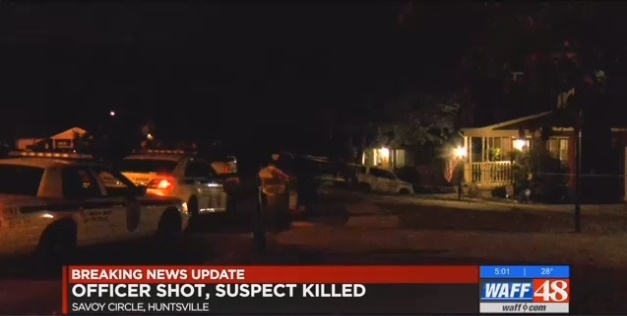 A Huntsville, AL, police officer is recovering after he was shot by a suspect on Sunday night just after 7 p.m., reports WAFF. Investigators say officers were called to a home on a domestic dispute between a mother and son that spilled out into the yard. Responding officers encountered 31-year-old William Freddy Carter Jr. inside the home. Police say Carter shot the first officer as he entered the room. The wounded officer returned fire, shooting Carter. Carter was pronounced dead at the scene. Police say the wounded officer is a six-year veteran and is at home recovering with his family. The case is still under investigation.